People who you can't meet face to face features work from Indigenous artists from around Australia, juxtaposing tactile object and photographic image to examine the motif of the doll in a variety of contexts. Featured artwork: Joyce Winsley, Granny Bass, 1999, guildford grass stitched and moulded, 30cm high, Copyright courtesy of the artist. 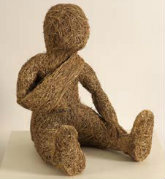 In an eclectic group of works from Destiny Deacon, Tracey Moffatt, the Noongar Doll Makers, Elsie Labumore Roughsey - whose autobiography lends the exhibition its title - and Joyce Winsley, the doll is variously an anonymous prop, a poignant effigy, a means of building community or a vehicle for cultural critique.